Gameplay is basic. You move with the D-pad and swap blocks with the buttons to make matches. You can choose to swap in two different playing styles, cross and normal. Cross is swapping blocks with a cross cursor, while normal uses a cursor that only selects one block at a time. 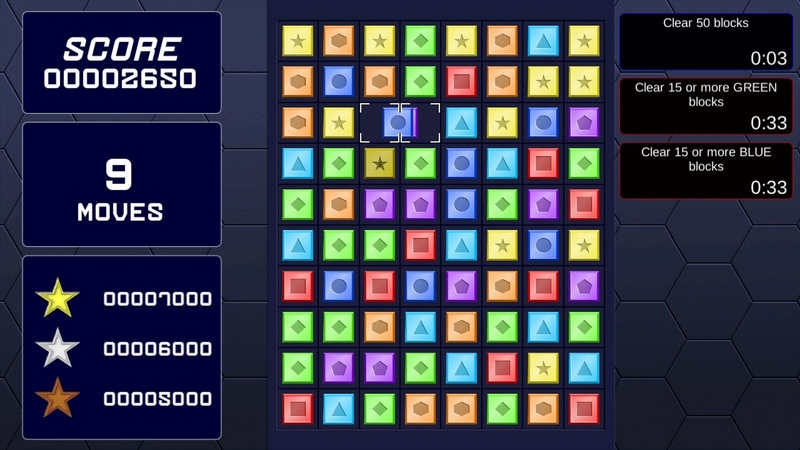 Inside most puzzles are six different types of special blocks alongside the regular colored blocks. Super blocks are obtained by matching four regular blocks; these blocks explode a perimeter around where they are on the board. Rainbow blocks are gained by matching five regular blocks and they eliminate the color you swap them with off the board. 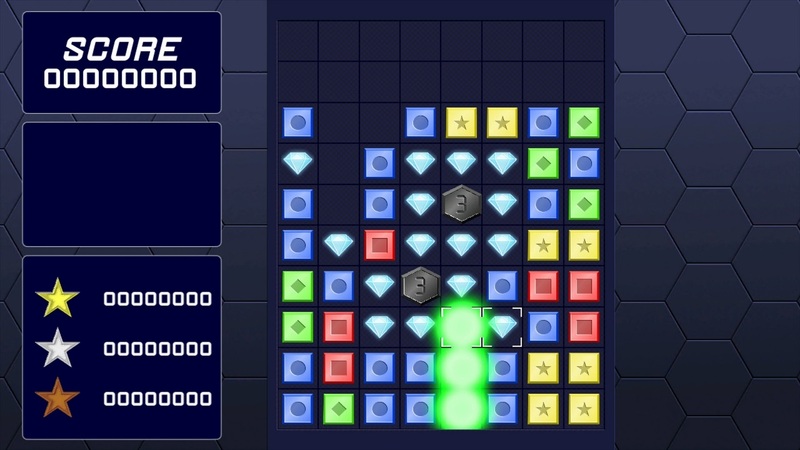 Bomb blocks appear at random and can only disappear if you match blocks adjacent to them. They tick down after every move and you’ll lose if they explode. 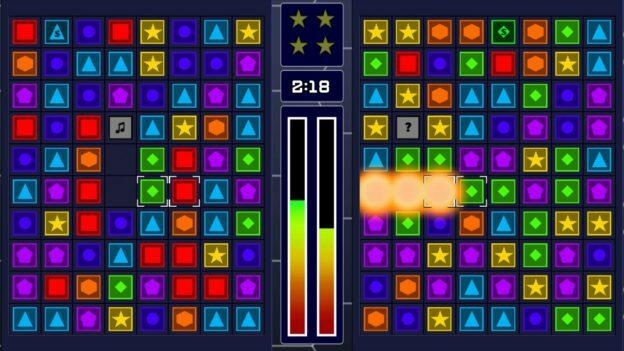 Rhythm blocks fall once every two seconds of gameplay and can disappear if you match them all or explode them with a Super block. Copy blocks change the same color of block you swap them. There are seven different types of game modes to play, most of them needing to be unlocked. 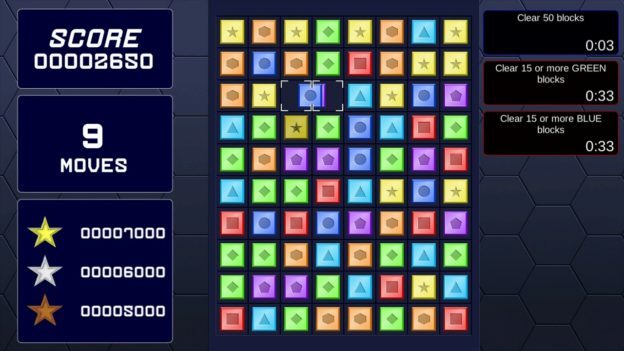 Normal mode is already unlocked and involves matching blocks to get a specified number of points, to earn either a bronze, silver or gold star. Timed has the same concept as Normal, but you’re limited by time. The P1 VS CPU is a match against a computer, involving quick matching in order to fill up a bar on your side of the screen to win in two rounds. In Challenge you play through 16 various challenges, however, the stars you earn are not saved at the end of the game for some reason. 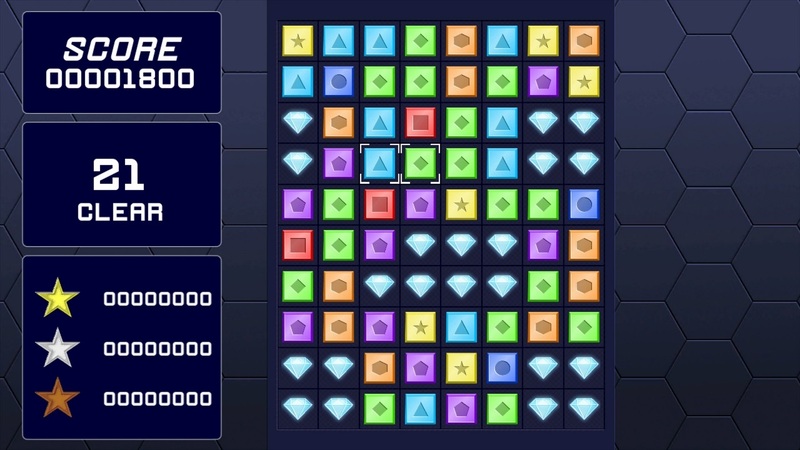 Custom Puzzles is where you play whatever number puzzles you have made in a puzzle maker feature, although creating the puzzles would have been much easier with the use of the stylus. The games you create for Custom Puzzles all play the same type of challenge, matching all the blocks without any left over. Marathon plays until you lose and you can only lose if a Bomb Block goes off. The final game mode is Normal Plus, where you match a certain color block in a specified amount of moves. I found the game to be okay but I have quite a few issues with it. 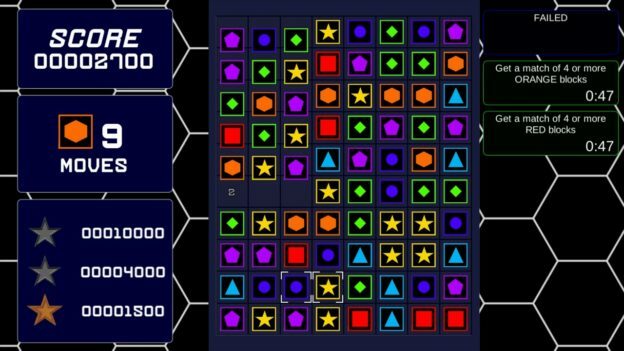 I was annoyed with most of the modes needing to be unlocked before playing. I also would have enjoyed the option of multiplayer, one that could have played similar to P1 vs. CPU. Also, there are missions on the side of the screen during most of the modes that do nothing. They don’t add points to your score or cause you to lose if you don’t complete them. 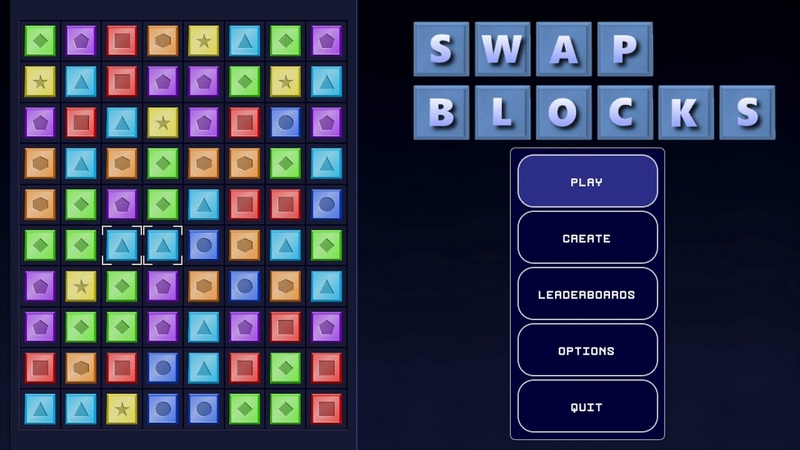 Overall, Swap Blocks is far from perfect and mediocre as it is. I would say that it is overpriced at $4.99. But, if it goes on sale, I might recommend taking a look. My background in gaming started with PC games and the good old Sega Genesis. However, when it came to Nintendo, I was introduced to the GameCube and it became one of my favorite consoles. The DS Lite also holds a special place for me. I was introduced to Pure Nintendo by my good friend Trevor Gould. I look forward to putting my hobby of writing to use and playing new games.